An 18 pounder! i have to confess. I like tubby cats. Also if you could train him to do "jazz paws" it would be awesome. 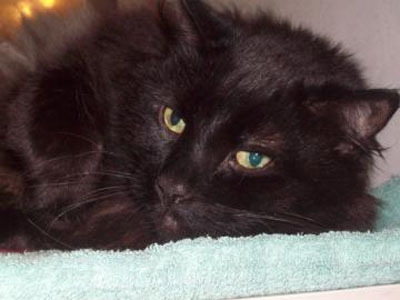 Jazzy is a 7-year-old male cat who weighs nearly 18 pounds. He has been at Lollypop Farm since the beginning of May because his owner could no longer care for him. This lucky boy is currently living in one of the offices here at the shelter. Jazzy is a handsome, curious and cuddly cat who will make a wonderful companion. He is very calm and enjoys attention. He absolutely lights up when anyone comes to talk or brush him and he has a way of charming people with his gorgeous green eyes. He lived with two other cats in his previous home and got along well with them. If you're looking for a true love bug, please come out to Lollypop Farm to meet Jazzy! Moo Moo, the dog from last week was adopted!